Marcus Law accused his Kettering Town players of hitting “the self-destruct button” after they suffered a damaging 3-2 home defeat to Biggleswade Town. In the first of three games in hand on Evo-Stik League South Premier Division Central leaders Stourbridge, the Poppies produced a dreadful second-half display after they had held a half-time lead through Dan Holman. Play-off chasing Biggleswade levelled soon after the break and then had Soloman Nwaboukei sent-off for a foul on Ben Milnes. But the visitors pushed on and stunned the hosts by opening up a 3-1 advantage with Kettering unable to produce a response until the final kick of the game when Marcus Kelly reduced the arrears. By that time, the Poppies’ misery had been compounded with Rhys Hoenes being sent-off for a second bookable offence. The loss leaves Kettering’s title hopes hanging in the balance as they still trail Stourbridge by four points but now have just two games in hand. Law will now be looking for a response from his players when they take on Royston Town at Latimer Park on Saturday. But he was left unimpressed by what he saw in the second half. 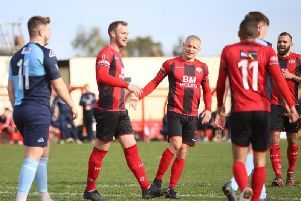 “We knew we were going to be under a lot of pressure physically, we knew we had to make sure we worked extremely hard, we knew we would have to get onto second balls and we knew we were going to play a direct game,” the Poppies boss said. “We always felt we had the pace and the quality and in the first half I thought it was there. “The wind got taken out of us straight from the kick off in the second half and we’ve had a poor clearance and we haven’t closed the man down on the edge of the box. “And for 15 minutes from there, we have hit the self-destruct button. “The same ball twice has created the free-kick which they scored from and the third goal where an error from the centre-half has let their boy in and he’s got there before Paul White. “It’s games like that which infuriate me as a manager because it’s not tactical, it’s a case of players not covering, not doing the work-rate that is expected and then a lack of concentration and not doing what we have asked them to do. “We have good quality but that didn’t show in the second half, we huffed and puffed but credit to them because they have worked their absolute socks off and defended like trojans and when they were given their opportunities, they took them. “I ended up having to rejig and move things around at a time when we really should have been in the ascendency. “The work-rate from them was coming from their defensive areas, they were shutting us down.